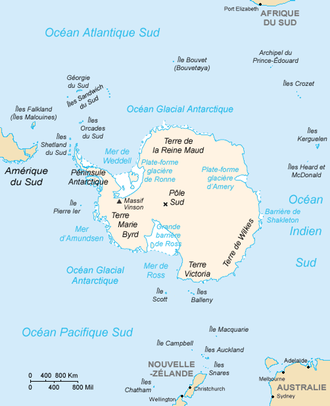 Antarctic : When and where to go? It is the coldest place on Earth, temperatures drop to -93 ° C. Precipitation is rare, but heavy snowfall is common on the coasts. During the summer period, the sunshine can be extreme and it is daylight 24 hours a day. Only five months of the year allow a tourist visit in Antarctica, located during the austral summer, between November and March, because the rest of the year It is dark and extremely cold. In November, the pack ice begins to break and then begins breeding season for penguins and other birds. But even during this period, it never makes more than 10 ° C, the winds are violent, the sun intense, the ubiquitous ice. The human population is about 1500 people, who do not reside permanently, but on mission and alternate on bases of work and exploration. There is an Orthodox church on the Russian station and an ecumenical chapel on the American base. The climate does not allow for dense vegetation or important fauna. There is therefore no tree or shrub, but in some places mosses and algae. On the other hand, there are 40 species of birds, such as terns, penguins, petrels, cormorants, and 300 species of fish or cetaceans, including the blue whale, orca, dolphins, sperm whales, Elephants, seals. There is no terrestrial mammal. As mentioned above, in November the breeding of penguins and other birds takes place, then in December and January the penguin babies hatch, and they are fed. Finally, between February and March, they cover themselves with feathers and adults moult. It is also during this period that whales can most easily be seen. So it will be a contact with the environment so special that will be your main activity. Note: You must behave responsibly and follow certain unavoidable rules, such as not approaching animals and do not disturb them, throw no waste, take no eggs, no plants, no seashells. Admire this wild and pristine beauty with its grandiose landscapes, discover the fauna, and take pictures. It only takes a valid passport to enter Antarctica, but some stops on the way can make a visa necessary. The currency most commonly used on the spot is the US dollar but depending on the area, other currencies such as the euro may be used. A boat trip to Antarctica (a special cruise ship for a cruise between 10 days and 3 weeks) from Ushuaia, Tasmania or New Zealand, Commute between ships and land. The price of cruises starts from 4000 € for ten days, but in general they come back much more expensive. Health: there is no mandatory vaccination, but universal vaccinations are as usual recommended. Climatic conditions require great vigilance and you need warm clothes even in summer. Attention also to contagions aboard ships, which are favored by confinement in enclosed space. Security: Time can quickly deteriorate, be vigilant. Beware of the risk of crevices on ice fields, and the risk of high fire due to the very dry environment, so be careful if you handle flammable materials. A good physical condition is also necessary to avoid any problem. Note: there are opportunities to travel as a tourist on a French supply boat, or to join a government expedition if you have special skills (medical, scientific, technical) or are invited by a team As a journalist, photographer or artist.